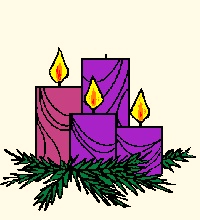 GAUDETE IN DOMINO SEMPER - REJOICE IN THE LORD ALWAYS - This is Gaudete Sunday when we light the pink Advent candle and pause from the warnings of judgement and end times to rejoice that our Lord is near. In our first reading (Zephaniah 3:14-18), the people of Israel were given comfort that the "Day of the Lord" would come when the judgement against them would be removed and they would be renewed in God's love. "Shout for joy, O daughter Zion! Sing joyfully, O Israel! Be glad and exult with all your heart, O daughter Jerusalem! The LORD has removed the judgment against you; he has turned away your enemies; the King of Israel, the LORD, is in your midst, you have no further misfortune to fear. On that day, it shall be said to Jerusalem: Fear not, O Zion, be not discouraged! The LORD, your God, is in your midst, a mighty savior; he will rejoice over you with gladness, and renew you in his love, he will sing joyfully because of you, as one sings at festivals." In our Epistle reading (Philippians 4:4-7), Saint Paul's letter forms the scriptural basis for GaudeteSunday with his double invitation to rejoice, "Rejoice in the Lord always. I shall say it again: rejoice! Your kindness should be known to all. The Lord is near. Have no anxiety at all, but in everything, by prayer and petition, with thanksgiving, make your requests known to God. Then the peace of God that surpasses all understanding will guard your hearts and minds in Christ Jesus." In our Gospel reading (Luke 3:10-18), John the Baptist instructed his followers in how they were to live and that he was not the Messiah, but one mightier than he was coming. "Even tax collectors came to be baptized and they said to him, 'Teacher, what should we do?' He answered them, 'Stop collecting more than what is prescribed.' Soldiers also asked him, 'And what is it that we should do?' He told them, 'Do not practice extortion,do not falsely accuse anyone, and be satisfied with your wages.' Now the people were filled with expectation, and all were asking in their hearts whether John might be the Christ. John answered them all, saying, I am baptizing you with water, but one mightier than I is coming. I am not worthy to loosen the thongs of his sandals. He will baptize you with the Holy Spirit and fire.'" And so, as we wait for the Day of the Lord, we are comforted that He is near, always near, no matter what, He is near.